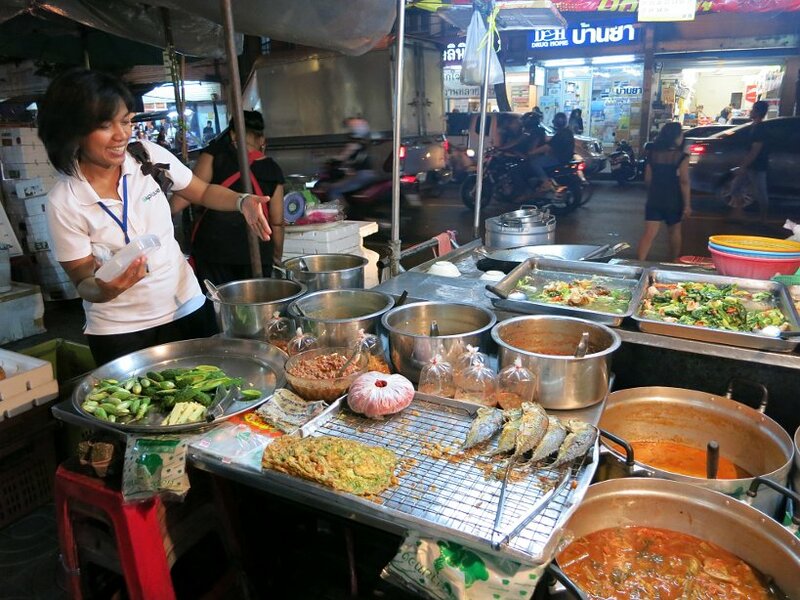 The Bangkok food scene is renowned worldwide and it is easy to find street food at every corner. 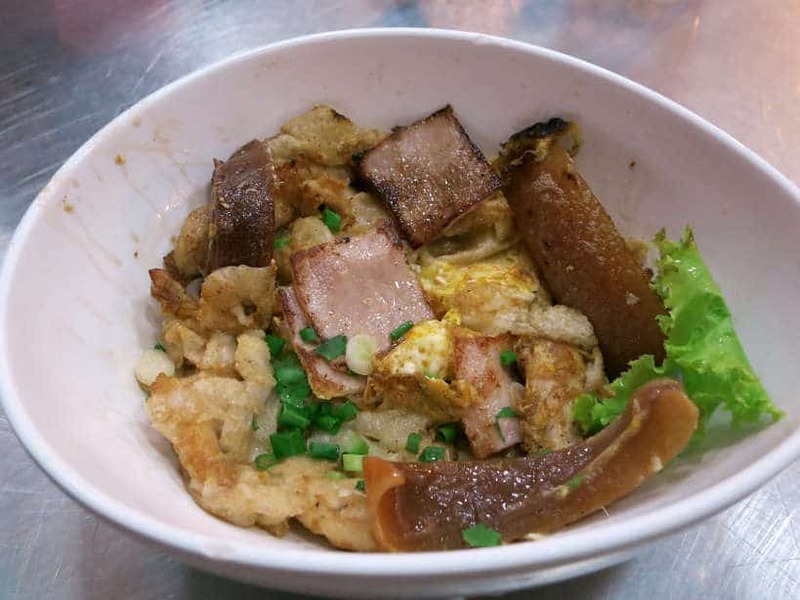 Why then would you want to take a food tour in Bangkok at night? Well, the food scene can be overwhelming and a bit of guidance goes a long way. 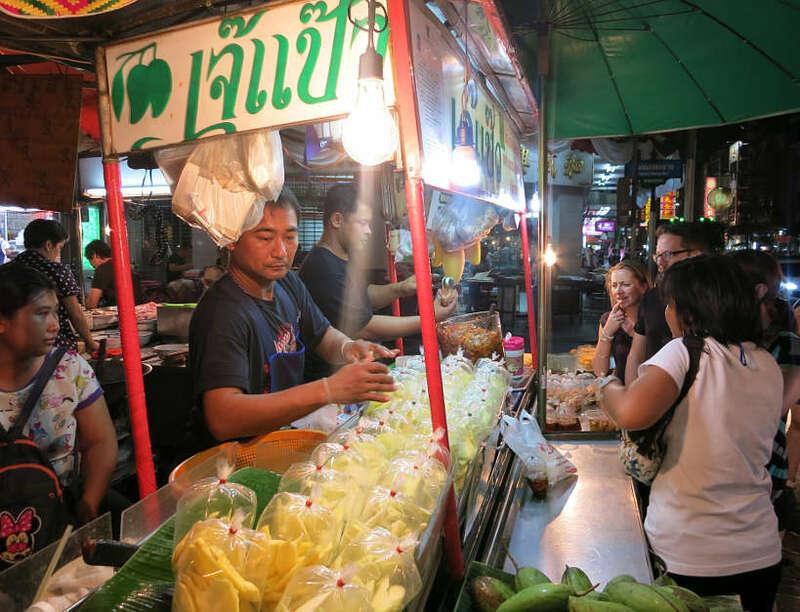 Also at night, the weather is cooler, your senses are heightened and Bangkok becomes fully alive with the smell and sounds of the street vendors. One of the most iconic modes of transportation in Bangkok is the tuk-tuk. So when the opportunity to explore the food scene on a tuk-tuk came along, we jumped on it. Ready? Follow us on the streets of Bangkok! Our guide for the food tour in Bangkok at night was Expique, a Bangkok based company that focuses on local, off the beaten path experiences. The meeting point was Krung Thonburi BTS (train) Station at 6 pm. Here we met up with the rest of the group, a British couple, a young lady from Calgary and the two of us. A small and intimate group. Simon, the founder of Expique and “Net”, our food tour guide for the night, welcomed us with a tasting of four flavors unique to Thailand – tamarind, mango, banana, and ginger. Simon and Net sharing the flavors of Thailand. Can you match the flavors to the products? After a brief introduction to the area and agenda for the evening, we excitedly hopped into our tuk-tuks for a food adventure in Bangkok at night. 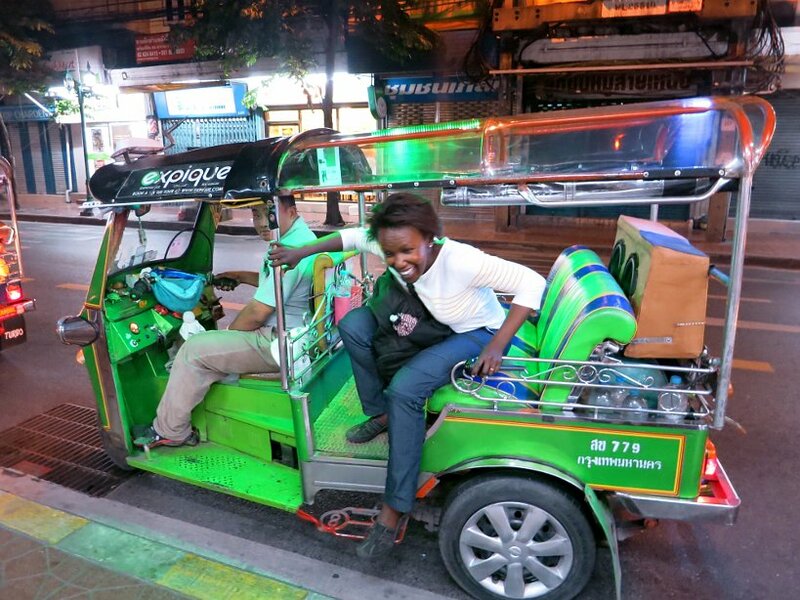 Expique keeps the tuk-tuk experience fun and safe, with small groups and 2 people per vehicle. With our taste buds open, we made our way to Tha Din Daeng road for appetizers. 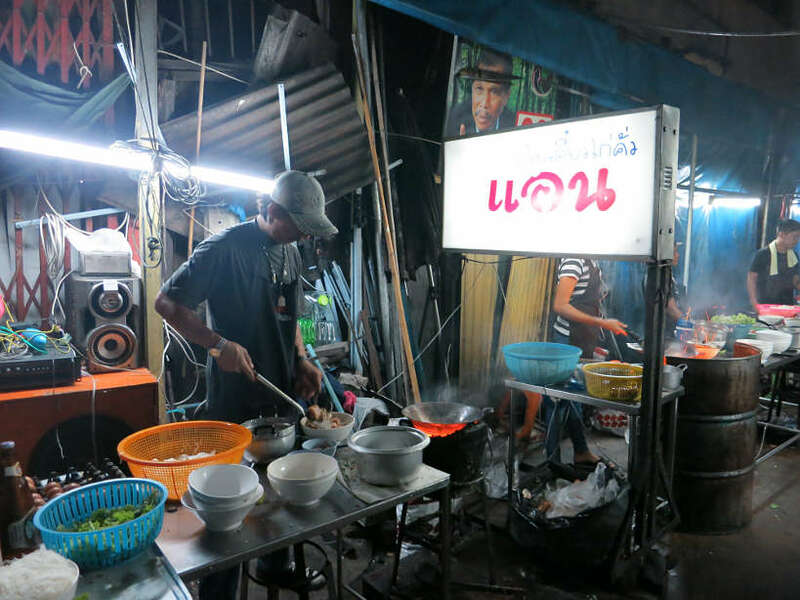 Tha Din Daeng road is one of the least known (among tourists) but one of the exciting spots to get a tasting of local Thai street food in the Bangkok. 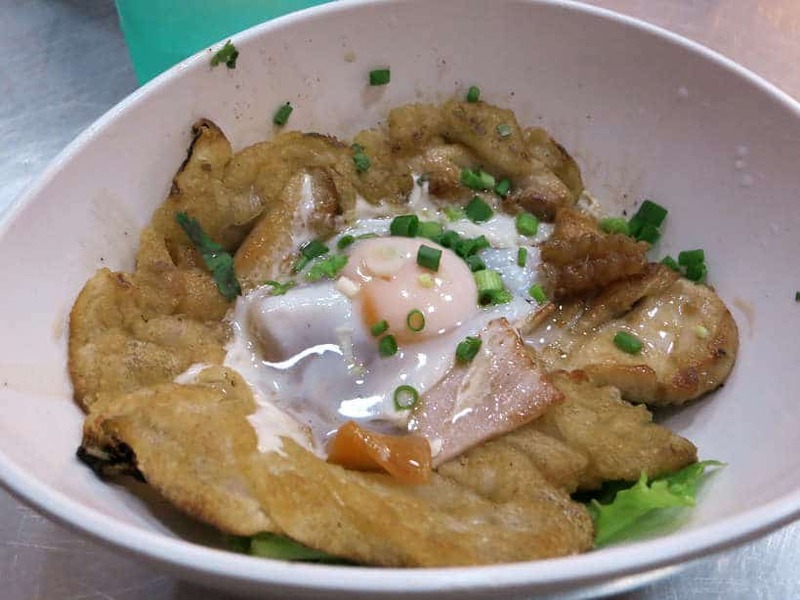 As we walked down the streets of Bangkok by night, Net, our guide would point out different dishes and tell us about them as well as how they are prepared. In addition to being a food tour guide, Net also runs her own food stall where she sells soy-based products for breakfast. As a result, we got in-depth local information from a local street food vendor. You can’t beat that level of authenticity! For appetizers, we had local Chinese drinks and satay. One of the drinks was bitter and made with Chinese herbs. The other one was a sweet tea made with the Lotus plant. Both these traditional drinks have wellness benefits. Next, we cozied up at the impossible to miss satay grills heaped high with pork satay. 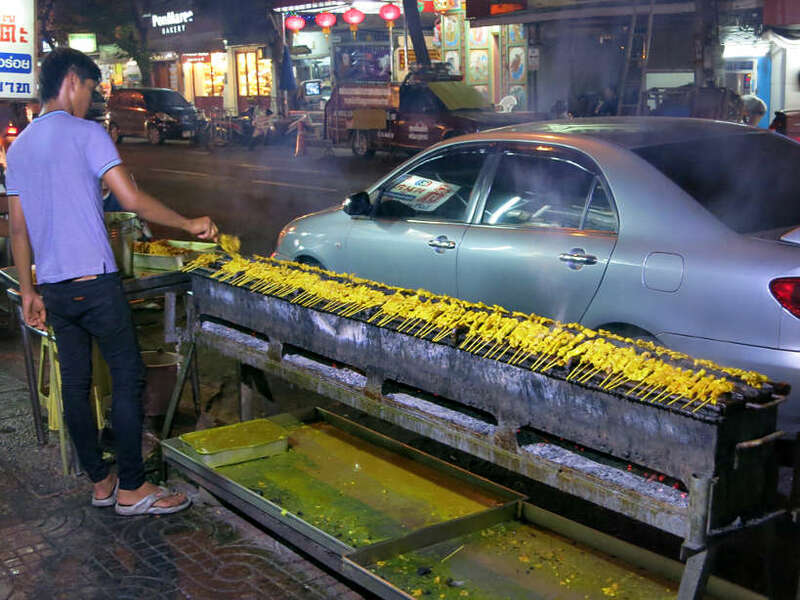 This famous stand is said to grill over 3,000 skewers at a time. We enjoyed delicious pork satay and chicken liver, dipped into various Thai chili sauces. The thought of grilled chicken, didn’t excite us at first when we learned it would be our next step. We didn’t know what to expect, but we went along with it, enjoying the tuk-tuk ride in Bangkok at night. We made our way over to Bangkok’s main flower market, Pak Klong Talad. Sitting across from the flower market, we were treated to delicious sweet chicken. The sweet chicken, lightly fried, was covered in spicy chili sauce that went perfectly with rice and a side of vegetables. 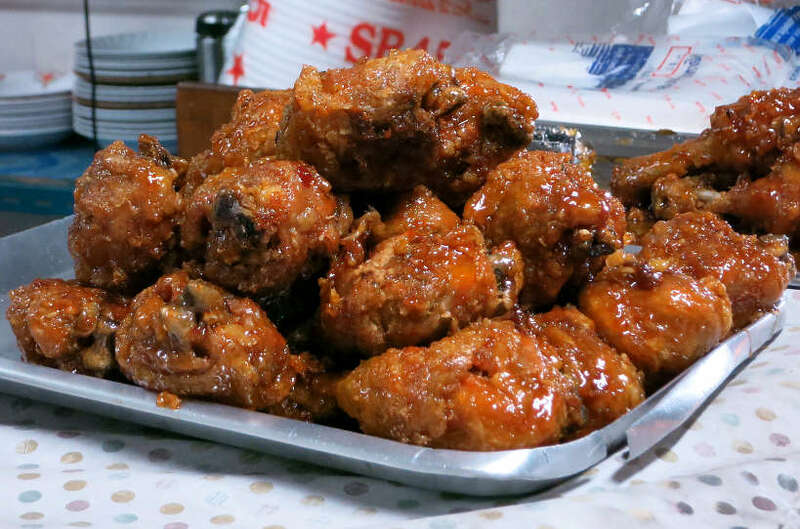 This was an unexpected and succulent introduction to the famous sweet chicken in Bangkok. 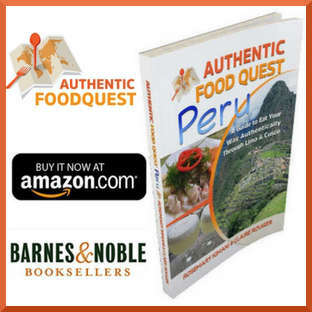 This reminded us of the famous “Peruvian style chicken” though the flavors were quite different! 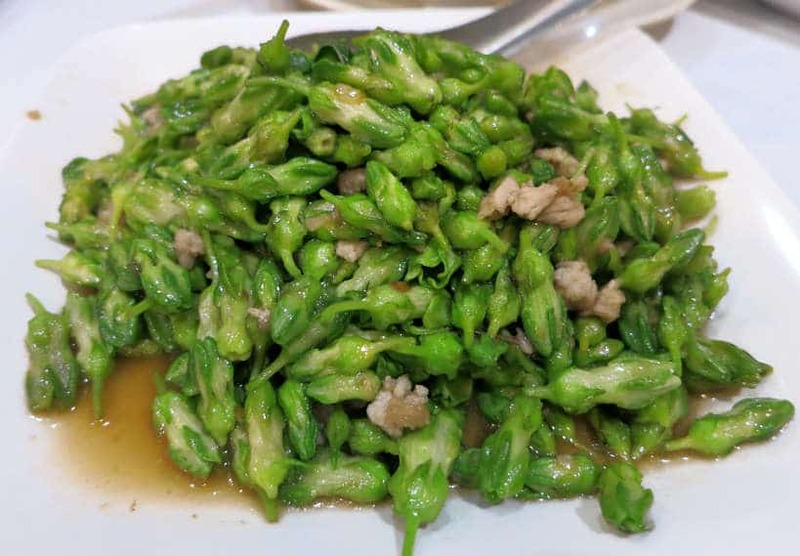 When we walked into the unassuming Krua Apsorn, restaurant, we were immediately struck by all the accolades on the wall declaring it a top restaurant and one of the best restaurants in the world. One of the reasons the restaurant is famous is because the owner of the restaurant used to cook for the Thai Royal family, different from Royal Laos cuisine. While the decor is nothing to get excited about, the food is outstanding, and the best food we had on the tour. You cannot visit Thailand and not have the curries. 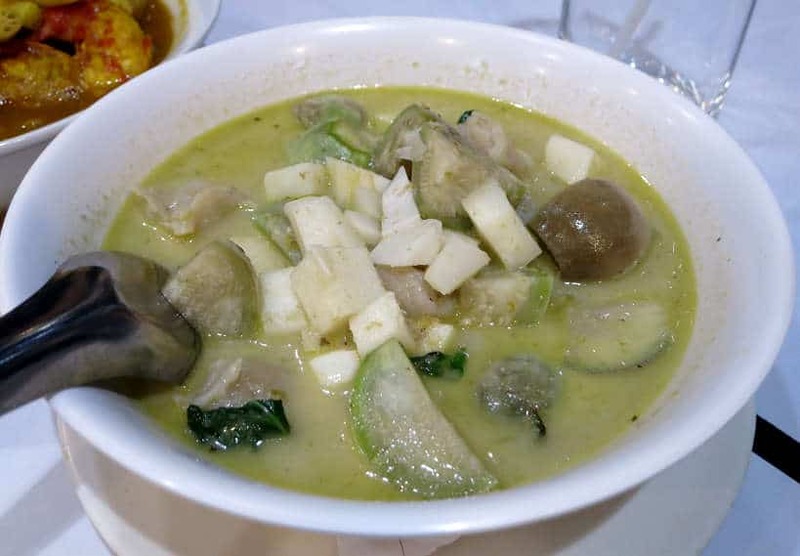 As such, we had the green curry with chicken and the yellow curry with prawns and lotus shoots. Both these curries were served with rice and seasoned to perfection. The two dishes that had us begging for more were the stir-fried dishes. 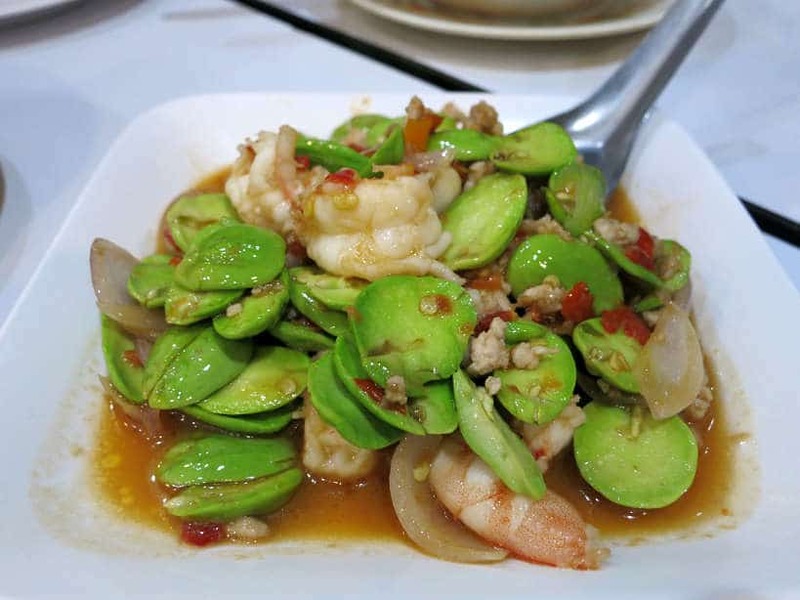 The stir fried stink beans with shrimp and minced pork and the stir fried Thai flower with minced pork. These mouthwatering dishes were exquisite. The crunchiness of the vegetables with the contrast of the spicy pork and shrimp sauces was perfectly balanced. This was our first time tasting Thai flower and we absolutely fell in love. This stop was well worth the visit and a great introduction to authentic Royal Thai dishes. 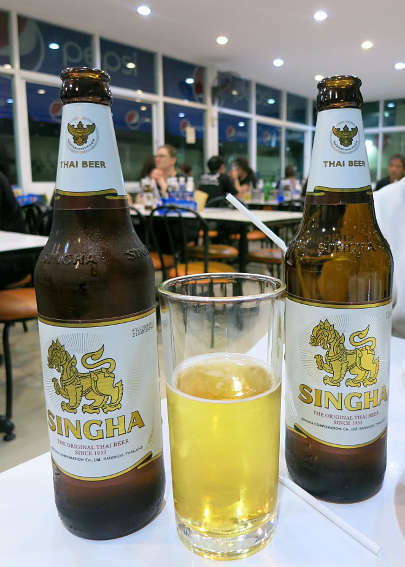 An alcoholic drink is included on the tour and the group had a chance to enjoy the Thai beer Singha at the restaurant. After having indulged in so many delicious and iconic Thai dishes, a break from the food was welcomed! That’s when we stopped at Wat Pho just south of the Grand Palace. This temple has the largest collection of Buddha in Thailand, including the famous reclining Buddha. 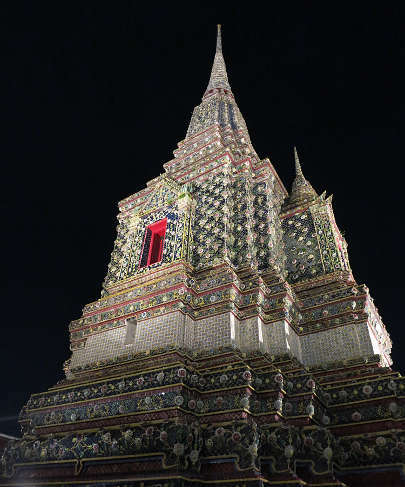 We had visited Wat Pho during the day and to our surprise we discovered that we could come to Wat Pho at night as well and for free! Although we could not see the reclining Buddha, it was nice to walk around in a much quieter and peaceful environment. After Wat Pho visit, it was time to head toward Chinatown and its famous street foods. Our guide led us through an obscure back alley just north of Chinatown where fresh noodles were sizzling in large pans. It was fun and quite a show watching the skillful cooks tossing the noodles and playing with fire. We walked into the back an eatery called Ann Guay Tiew Kua Gai and ordered two versions of the main fried noodle dish we had just seen cooking outside. 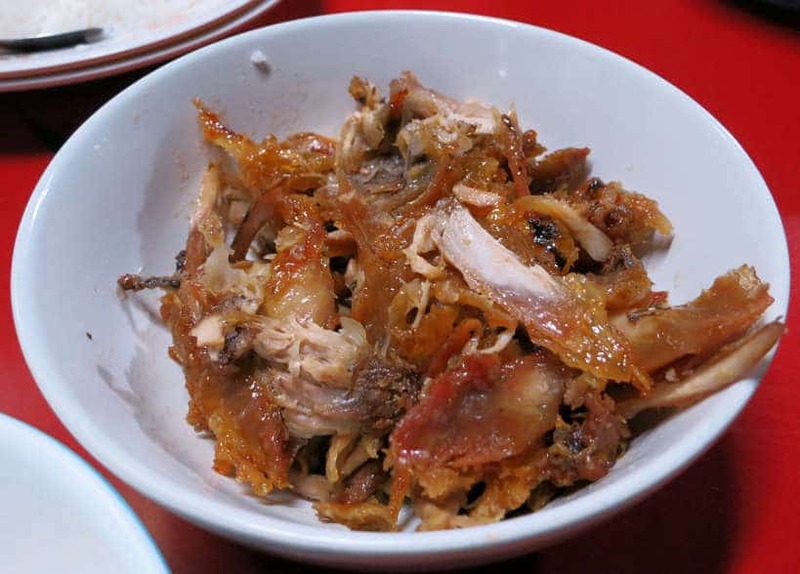 I had the roast chicken with egg noodle dish also called Guay Tiew Kua Gai. 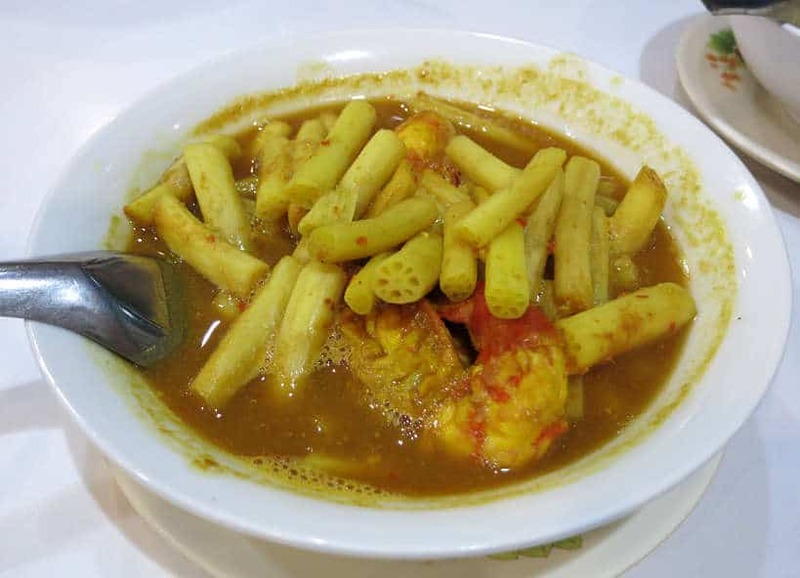 While Rosemary tried the roast chicken-ham squid noodle dish. Wow, be prepared for heavenly tasting but greasy dishes. The noodles are sticky and crispy at the same time. The flavors are a mix of the charcoal from the fire, the greasy oil enhanced with soft chicken and a runny egg. I found the taste quite delightful though the noodle dishes are not geared towards the light eater. Rosemary, on the other hand, liked her dish, but found it a bit too much after all the food we had already eaten. It is definitely a unique experience you’ll want to have in this hard to find eatery. We got to Chinatown or Yaowarat, our last stop at about 10pm. We were all already stuffed from all the eating, but eager to try popular local desserts. The energy in Chinatown in Bangkok at night was pulsating. There were people everywhere fires burning cooking up a variety of delicious treats. We made our way over to a dessert stall across from the Shanghai Mansion Hotel, where we were treated to one hot dessert and two cold treats. What we enjoyed about the dessert choices is that they were unusual and not the typical popular desserts you find in Thailand. The Black Sesame Dumpling in Ginger was Rosemary’s favorite. This hot dessert was served in ginger syrup. The dumplings were soft and chewy and filled with a sweet black sesame paste. This dessert is delicious and popular at festivals and events. Rather than the popular mango sticky rice dessert, we had green mango with a sweet fish sauce with chili. 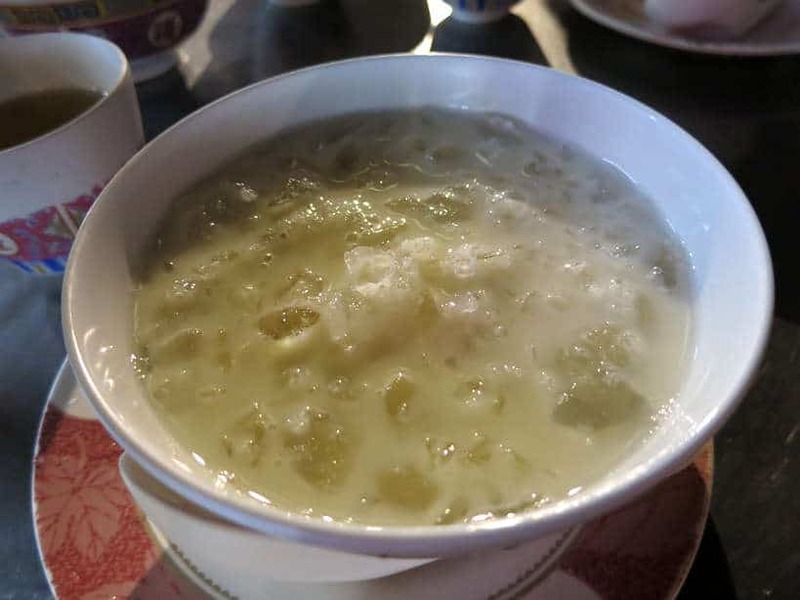 This simple dessert is made up of slices of green mango and a spicy chili dipping sauce. As unexpected as that might sound, the flavors complement each other for a delicious sourness. 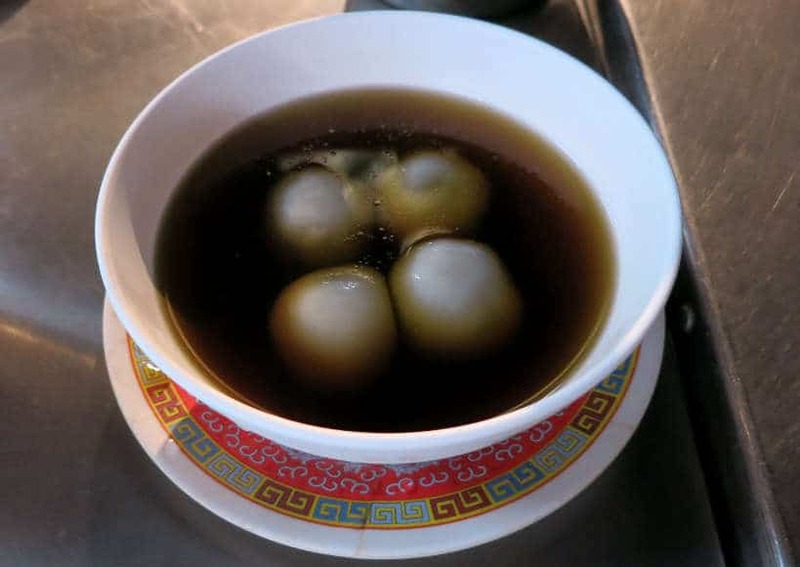 Birdsnest is a Chinese delicacy, believed to have a number of health benefits. We had seen it on an earlier visit to Chinatown and were curious to try it. As a dessert, we had the Gingko Birdnest version that came with ice. While it was tasty, it lacked in flavor as compared to the sesame dumpling or the spicy chili sauce with the green mangos. 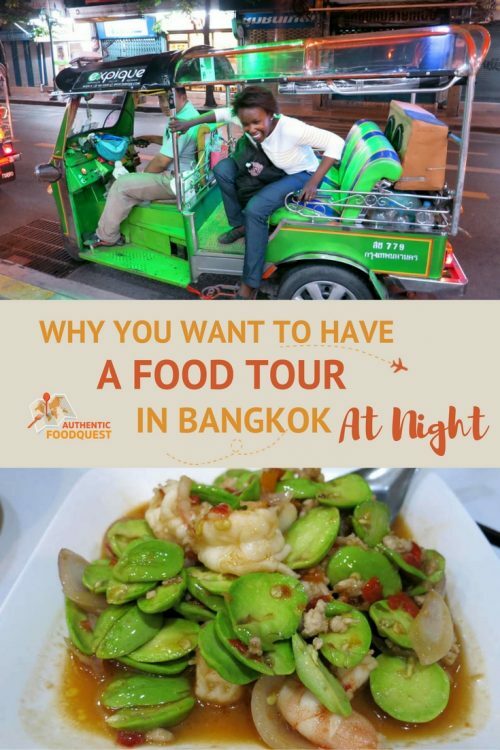 Although we love exploring cities by ourselves, we found Expique’s food and tuk-tuk adventure in Bangkok at night to be a fun and insightful tour. Getting leisurely and safely transported in Bangkok at night by tuk-tuk makes for a relaxed and entertaining experience. Combining that with off the beaten path stops at delicious eateries and learning about the dishes that make Thai cuisine special, was a real treat. 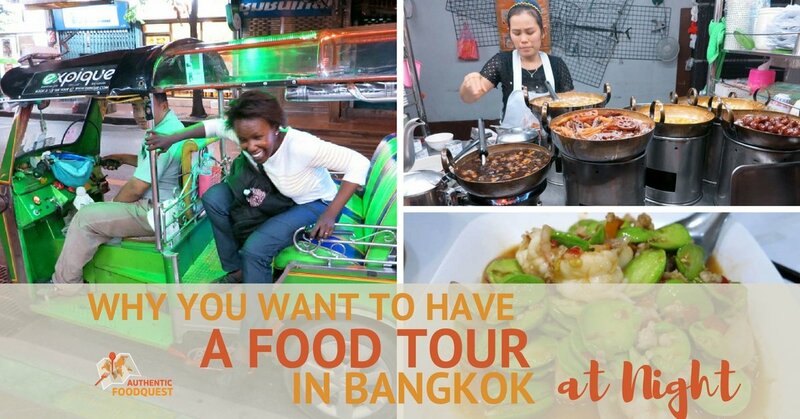 This Bangkok night tour is a great introduction to help you navigate the city’s overwhelming food scene. All in all, this Expique tour was a fun way to discover Bangkok at night. This tuk-tuk food tour Bangkok is perfect for first-time visitors or anyone looking to explore the city in a unique way. If you are curious about Thai culture and want to learn more, make time in your schedule to attend a Random Thainess event. Every month or so, Expique brings speakers together to talk about Thailand, Thai culture and Thainess. These are 6 speakers who speak for 6-8 minutes on 6 random topics relating to Thailand. We attended the November event and enjoyed hearing about Being a Thai Monk, Meditation in Thailand and more. Visit the RandomThainess Facebook Group for the schedule and details on upcoming events. Special thanks to Expique for having us on this tour. All views and opinions expressed are our own. Full bellies and happy taste buds too. Disclaimer: This page contains affiliate links. That means at no extra charge to you, we earn a small commission when you purchase using these links. Thank you for your support. What a delicious tour! So many different dishes and flavors to try. Would definitely love to join one of these tours. It was quite an enjoyable tour Hugo. All the different spots and fun rides in the tuk tuk. Definitively a must if you make it to Thailand 🙂 Cheers. Yum! Everything that you tried on this tour looks really good. I don’t recall having lotus shoots in any of the Thai dishes we had in Thailand and love that they look like pasta noodles. I especially love that there were no fried bugs on this tour, because I just can’t stomach trying the various fried bugs that seem to be everywhere at night. This tour looks like an absolute blast! I’ve been to Bangkok before and I love all the street food, however, it’s overwhelming to know where to begin if traveling independently. The thought of having a guided tour on a tuk tuk and being taken to all the best places sounds too perfect. Adding this tour as a must-do the next time I’m in Bangkok. Thanks for sharing your experience and recommendation! You are most welcome Heather. We highly recommend this tour for a fun experience in Bangkok at night. Let us know if you have any questions and don’t forget to stop back and tell us what you think!! Cheers. It sounds like my kind of tour! 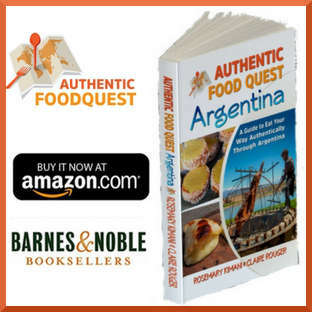 The food looks amazing and to be able to taste it with a local, in some off beaten places, it gives you a total different knowledge of the local gastronomy. But in this case, how did you handle all the spice? Was it to hot in the end? Great wrap up. I did a four day food tour in Thailand that started in Bangkok. Loved every minute of it. This one sounds terrific too. How good is the food, and the street food in Thailand. Still miss this food every day and do as much as we can at home to replicate it. 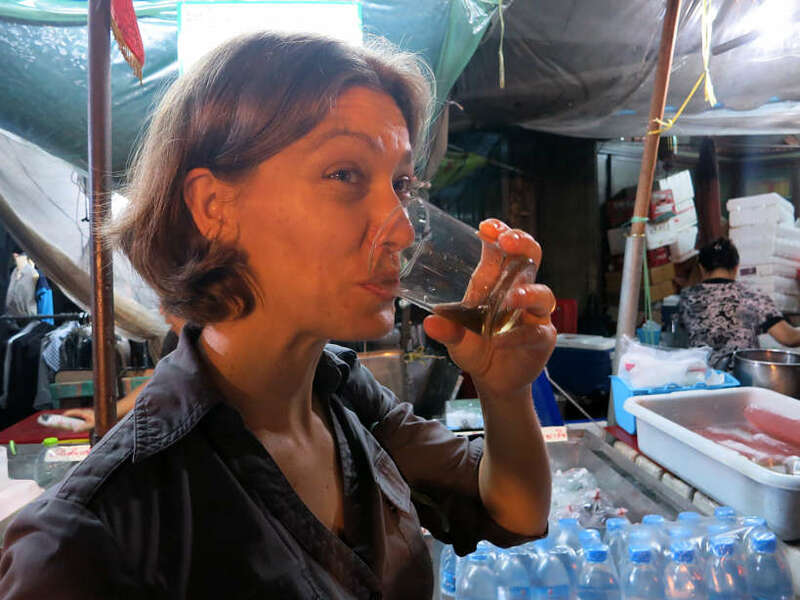 Wow, that must have been amazing Kerri, a 4 day food tour across Thailand. How fun!! Yes, the food in Thailand is incredible and the street food scene is outstanding. 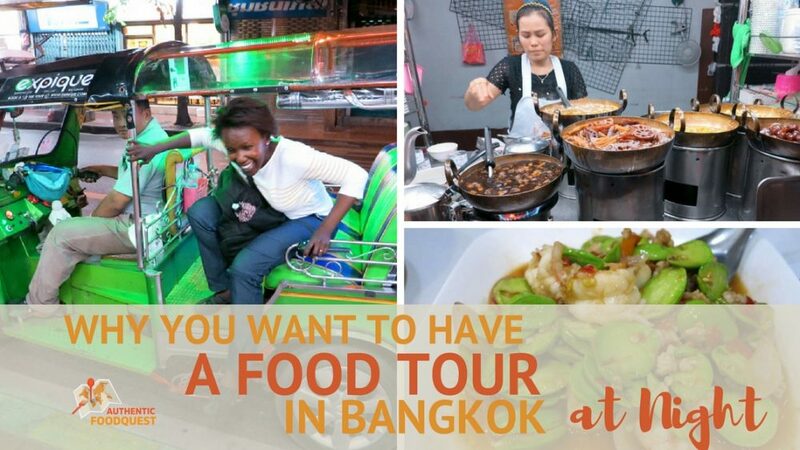 A food tour in Bangkok or in Thailand in general, is worth the experience. Thanks for your comments. Love the article. Thanks for sharing our tour. Thanks Simon for hosting us. We had a so much fun on the tuk-tuks and discovering Bangkok at night. 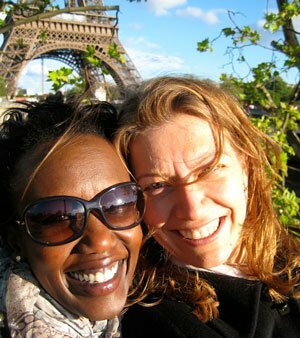 Net is a fun and very knowledgeable guide who really gave us a local and authentic experience. We highly recommend Expique for tours in Bangkok. Best wishes. Grilled chicken in a flower market?! Visiting the temple at night?! So wonderful. I loved eating in Bangkok but missed those two. Hi Elaine, two more things to add to you list for your next trip to Bangkok. Definitively check out Expique for a fun tour of Bangkok at night 🙂 Cheers! Wow, all of the food looks delicious. And there is so much of it. Might have to add this to my Thailand plans. The grilled chicken looks especially good. So glad you enjoyed reading about the delicious food on the Expique tour. The chicken was surprisingly good…highly recommend it the next time you make it to Bangkok. Appreciate your comments Rhonda! 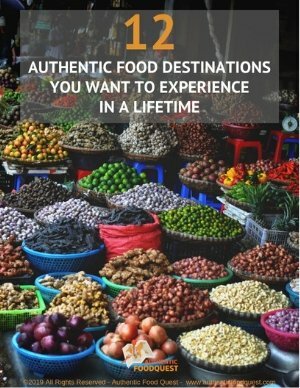 I absolutely love to take food tours when I’m in a new destination! This one looks amazing. I am now craving noodles and dumplings 🙂 Thanks for sharing! Food tours are so much fun, especially when they involve a tuk-tuk and seeing the sites by the night. Glad you enjoyed reading about the Expique experience. We appreciate your comments Carmen!! I would be too overwhelmed with so many dishes in such a short space of time. It must have been quite a thrill to jump on and off the tuk-tuk, and you could probably get wafts of all the smells driving past in a vehicle with no doors. 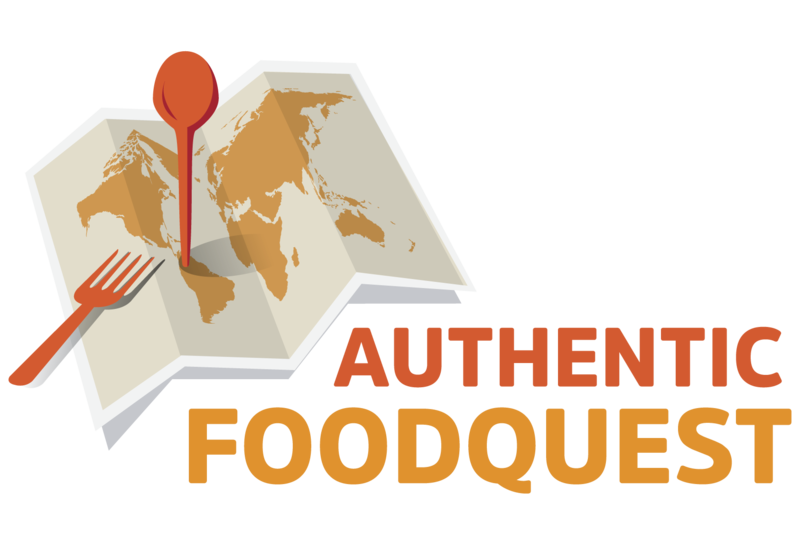 Oh WOW… I’ve always wanted to do a food tour like this, I’ve drooled my way through the whole tour. What an amazing adventure, bet your taste buds were singing huh. Thai food and Thailand in general is one of my favourite Asian destinations but I’ve never stayed longer than a night in Bangkok. You’ve reminded me why I have to go back soon. Food, glorious food. Well stated—food, glorious food in Bangkok. 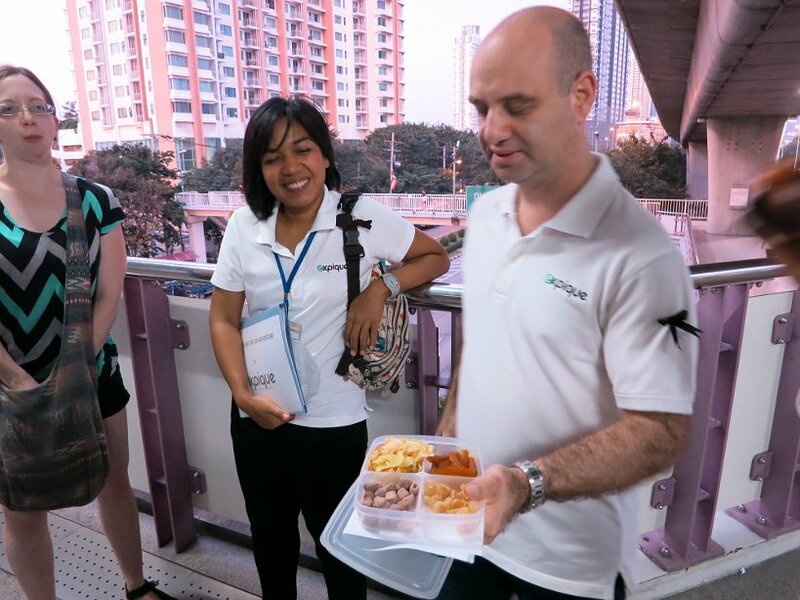 Even if you don’t have time when you are in Bangkok next, take the tour with Expique for a fun adventure. In about four hours, you will hit several local eateries and see quite a bit of Bangkok. Whatever you do, get back to Thailand soon for the food 🙂 Thanks Anna for your comments!! So glad you enjoyed the article, Trisha. Thank you for your comments. Indeed Thai food is unique and incredibly delicious, and best experienced in Thailand. Cheers!! OMG this all looks so amazing! And what a fun experience. 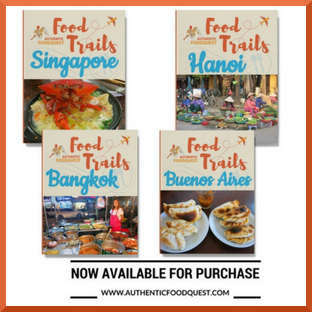 Up until recently, I have not been interested in any type of food tour (I like to create my own), but this seems like such as great time I’ll have to try it when I take the trip out to Bangkok. Beautiful pictures! Happy to hear that this convinced you to take a food tour. What made Expique really unique was the local insights from our local guide and the fun tuk-tuk experience. Give it a shot the next time you are in Bangkok and you will be amazed. So glad you enjoyed the article and our pictures 🙂 Cheers! The key to taking food tours is to eat light before the tour and then pace yourself throughout the tour. It can be difficult with all the delicious delights, but it is key to an enjoyable experience on the tour and post-tour. It is amazing how the street culture comes alive after dark. Feeling the energy and excitement is an experience all by itself. Have not made it to Japan or India yet…they are on the list to check out soon. Thanks for your comments Anastasia. Very well documented evening with articulate descriptions and great photos. My mouth is watering. Impressive article. To take experience of dining in Bangkok, is an incredible thing in our self. Thank you Anaya for your message. The food in Bangkok is incredible and a tuk tuk tour with Expique gives you a fun way to experience the local food. Cheers.